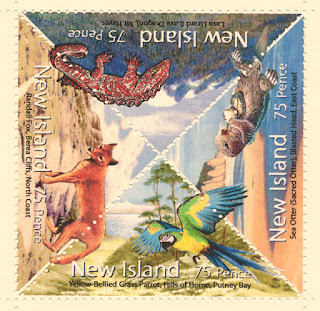 Until 1992, New Islanders were obliged to use Russian postage stamps. 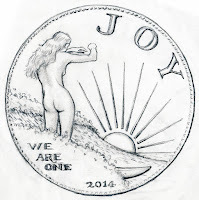 However, in 1985, Gordon Slant etched the Roger Putney 10 pence (top) on a copper plate, and printed hundreds of these in his shed near Wigsthorp. 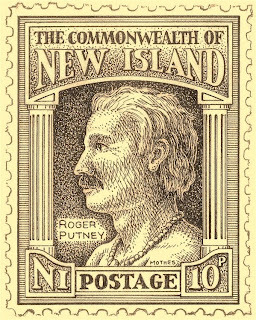 New Islanders were already talking about gaining independence from Russia, so these "spirit of Roger" stamps were only used on hand-delivered mail. Only about fifteen are known to exist today. Gordon Slant also designed the New Island Railways $1 stamp in 1992 but it was never issued. 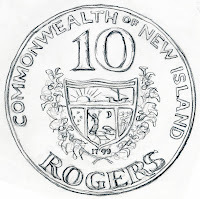 The "dollar" monetary unit was being considered at the time, but was soon changed to the "roger". 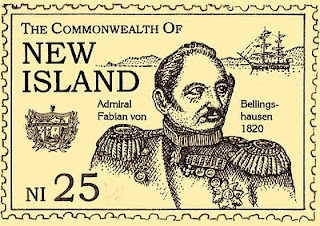 Soon after Independence, the Bellingshausen 25-pence was issued by the Ministry of Trade. 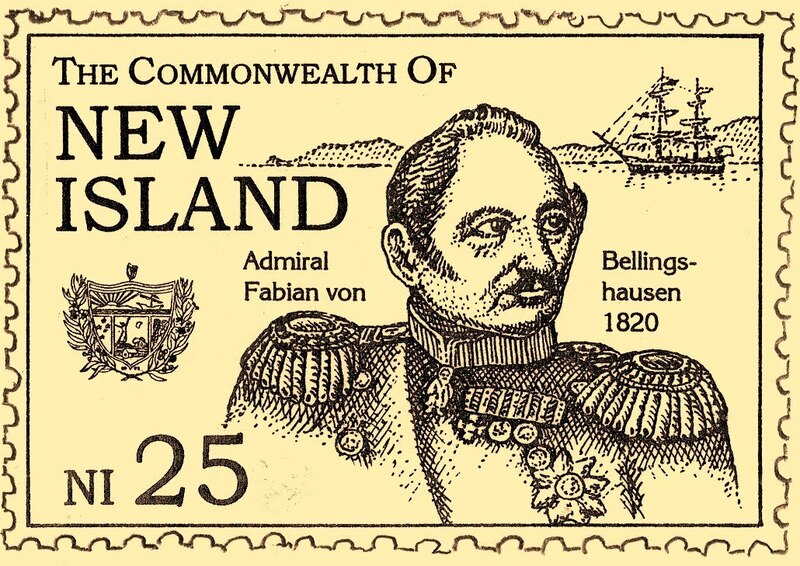 Ironically, this first stamp honored the man who had claimed the island for Russia, and it is still used today. 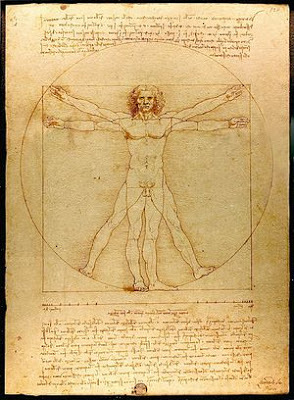 Vitruvian Man, Leonardo da Vinci's "Proportions of Man" drawing. Alan couldn't help but climb up Hobb's Wart after supper. He was a little nervous after hearing that the top of it was haunted. Other people in the cafe said they saw weird lights up there at night, yet no one claimed they'd ever been up there. Was it perhaps a landing site for UFOs? Alan wanted to find out. Hobart's one major street eventually turned into a faint footpath that took a zig-zag route up the slope toward the great rock. His curiosity pushed him up this path as it then skirted the base of the massive Wart. It does kind of look like a giant wart, he mused. After some distance, the path abruptly turned into a narrow cleft in the rock wall, and a series of steep steps led Alan up to the top. Wow, someone had carved all this... He climbed a while, then stopped to listen. It was completely quiet except the sharp chirps of numerous swallows he saw swirling and circling over the brush and trees below. Finally, a bit winded, he arrived at the broad top of the massive rock. 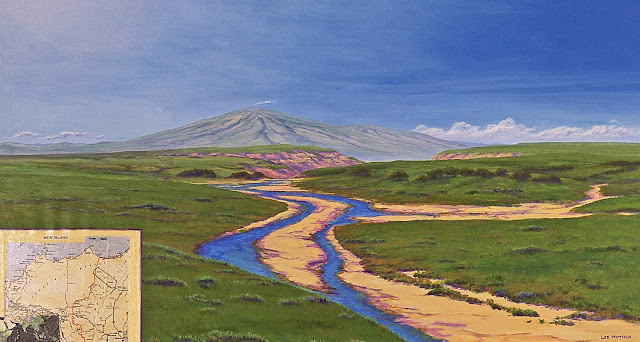 Toward its center, he spotted a large rectangular flat area, like a floor, carved into the rock. He also noticed a raised platform in the middle, apparently carved out of the same rock as the floor. 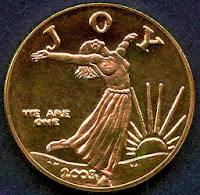 The platform's slightly slanted top faced west toward the now-setting sun, and on this was a carved-out vaguely human form, a bit under six feet tall, with legs and arms slightly spread, similar to the pose in da Vinci's Vitruvian Man. The thing looked inviting, like one was supposed to lie down in it! He reached in and touched the stone surface inside the thing, and ran his fingers along the arm to the finely detailed hollow fingers. The surface had been finished or worn very smooth, like fine marble, and the rock was warm from its exposure to the sun all day. Also, there seemed to be a silky feel to the inside, maybe from traces of oil or something. Elsewhere the stone had a much more pitted and weathered look to it. There seemed to be no other carving on the platform, or anywhere else. Alan didn't know what to think of this, but he began to pick up a definitely weird feeling here, like it was a secret and very private place. Part of him wanted to see if he would fit in the form, and the rest of him felt he should get away from here...now! 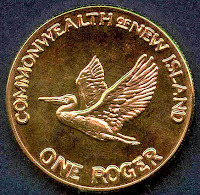 The Original one-roger, in brass, has been in circulation since 2003. 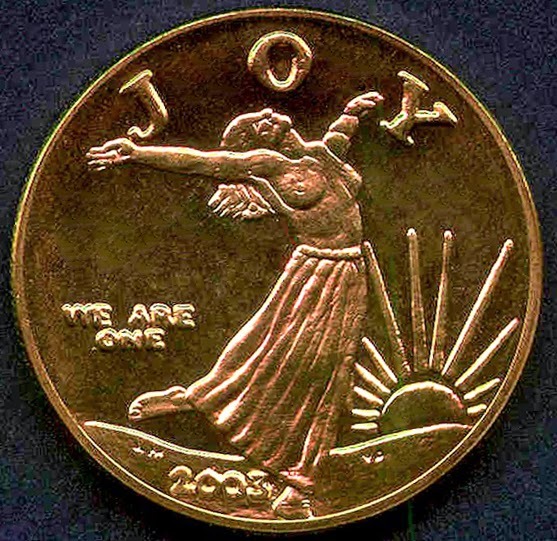 New Island continued to use Russian currency for several years after independence in 1992. 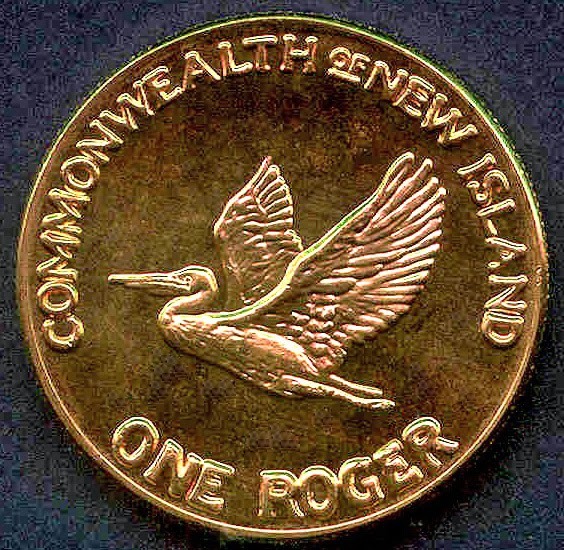 Finally, the new government enlisted the skills of medalist Virginia Jansen to create the nation's first issue, the one-roger. 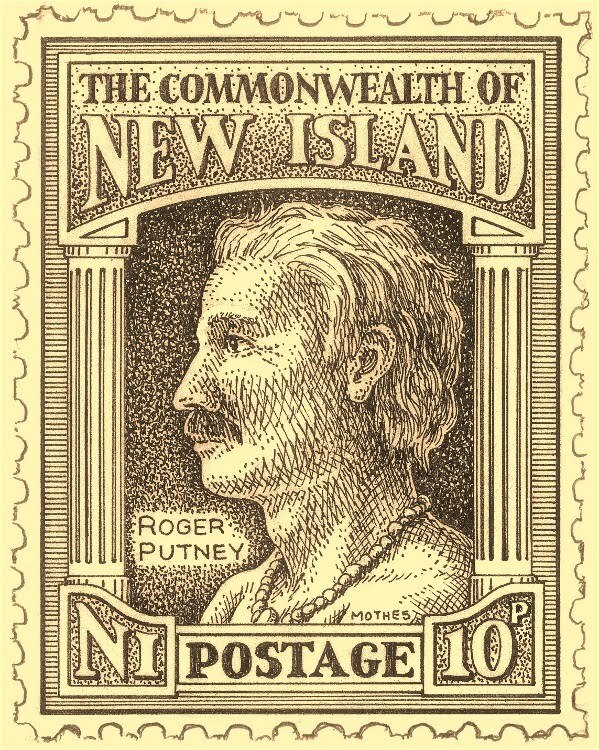 The "roger" denomination originates from Roger Putney, our charismatic spiritual leader during the first years of islander settlement. 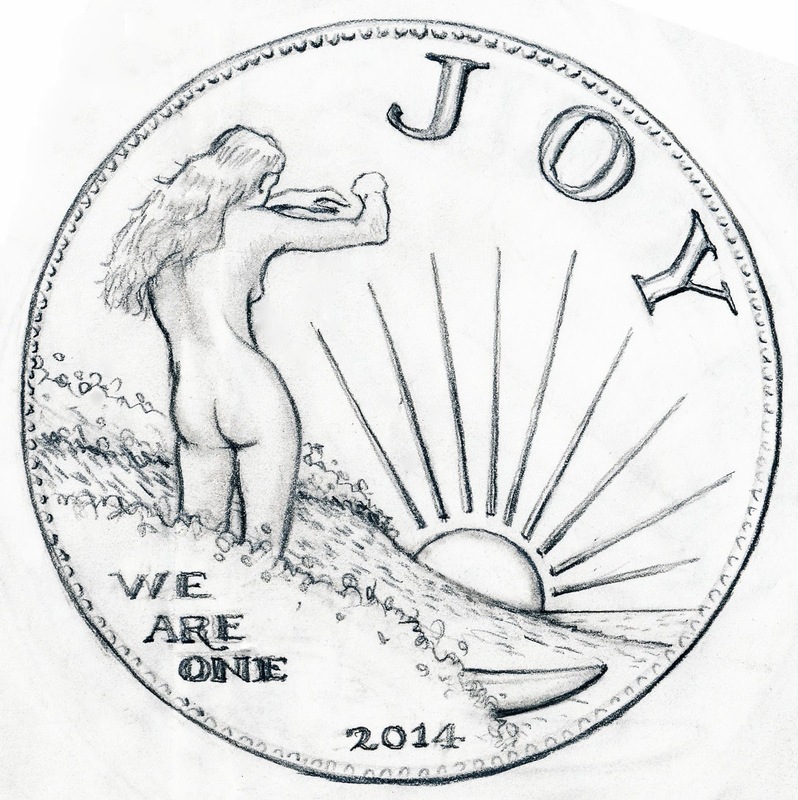 "We are One" and "Joy" are New Island mottoes. 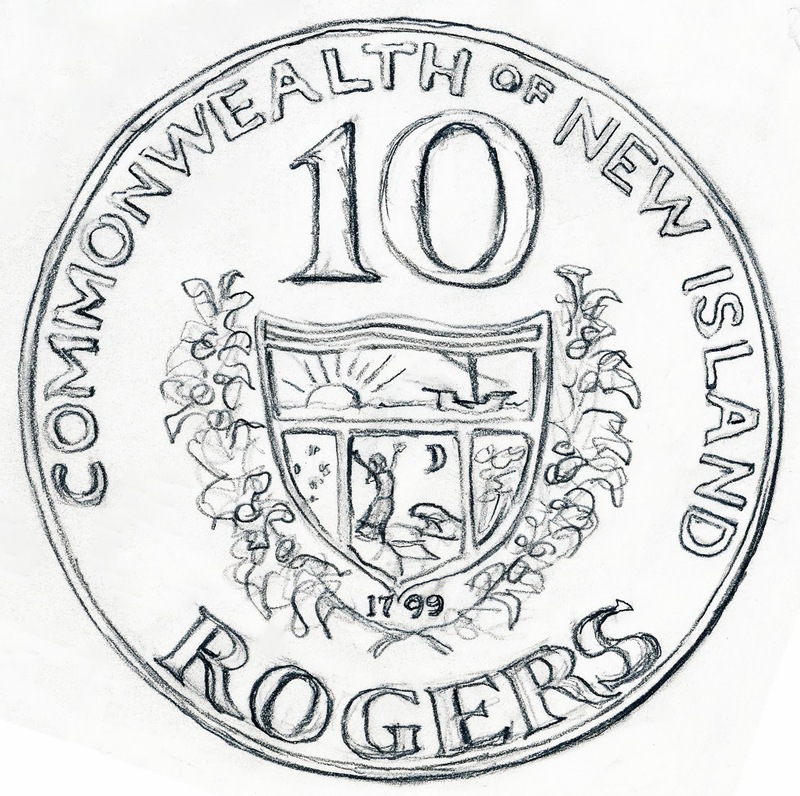 Until other denominations of ten-pence,100 pence, half-roger, ten-, fifty- and 100-roger coins are introduced, Russian (mostly Soviet) rubles will still be used to make change. Someone in Skegness sent in a "scientific article" to the Putney Times last week claiming that massive Mount Hayes may explode "just like Tambora" within the next few weeks. The geology departments at Putney University and at the School of Oceanography in Victoria Harbor have looked into the situation, mostly by checking the two tiltmeters that were installed on the mountain's upper slopes in 2012. Tiltmeters measure the slightest variation in ground movement or swelling, that may preclude a volcanic eruption. These have been used to some advantage on the Kilauea volcano on the island of Hawaii. The gases and steam output at the 8,500-foot-high crater have also been carefully analyzed in the last six months, as have the geothermal spring water at two locations on the mountain's lower slope. Since 2012, Mt. Hayes has indeed risen a little over 2 centimeters, according to one of the tiltmeters. However, there has been no noticeable change of gas and steam output or chemistry, nor any changes in chemistry or geothermal temperature of mountainside springs. Our Skegness resident wishes to remain anonymous, probably for good reason. She allegedly heard a message coming from the mountain while she bathed one night at Blair Hot Springs. "I heard a deep voice," she said. "It told me to beware and prepare - the volcano will soon change everything!" The "voice" then gave a detailed account of the kind of eruption, which included a big explosion at the summit, lava flowing all the way to the ocean, a huge ash cloud darkening the sky, and a "volcanic winter" on New Island. The small port-town of Skegness rests at the base of Mt. Hayes, on Putney Bay, and would be especially vulnerable. The official response from our resident volcanologists: "We see no immediate threat from the volcano. Remain calm and carry on." Another view of Mt. Hayes during the wildflower season - early spring. This is from Lake Riga, near Bunbay. 55. Where is Alan Now? 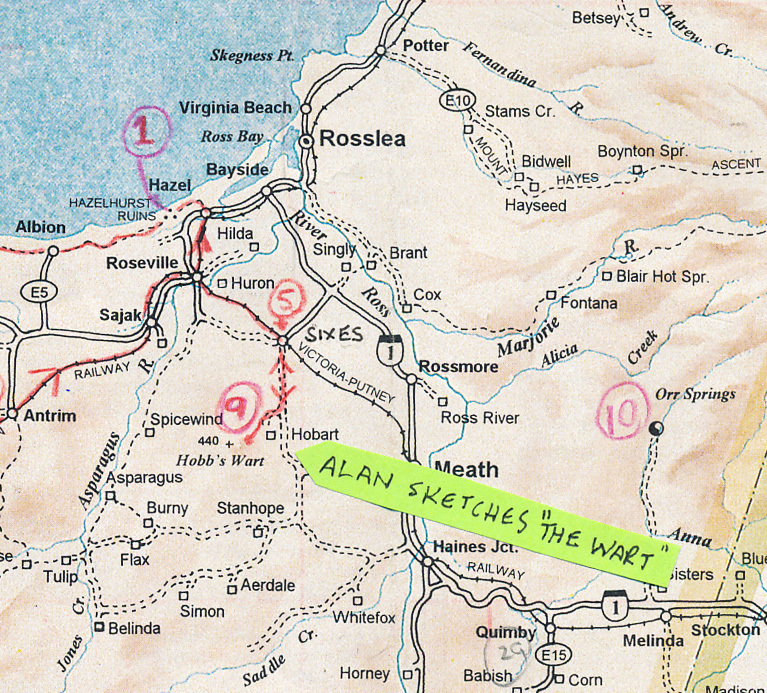 By noon, he felt alert enough to get out there and make a color sketch of Hobb's Wart (scenic feature no. 9 on The List). 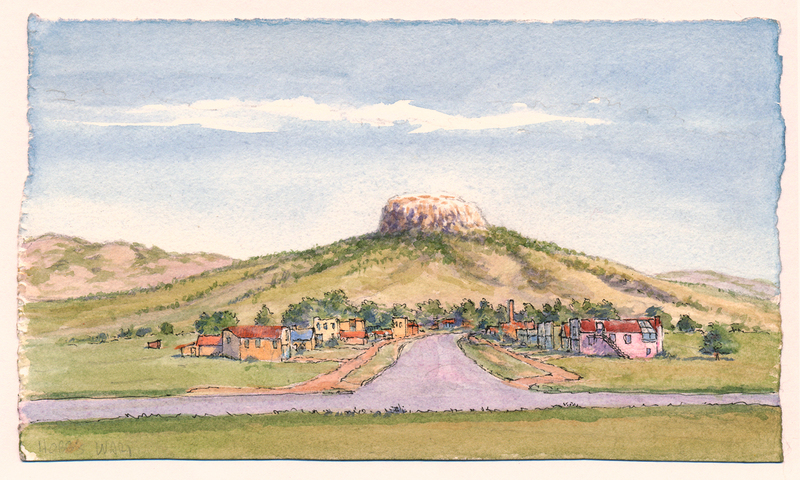 The Wart, as it was lovingly called in Hobart, loomed about a mile west of the town center. 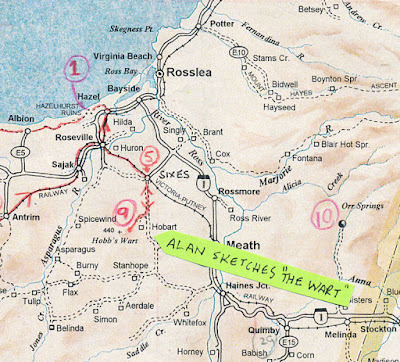 The more Alan sketched the thing, the more curious he became about what one might discover on the summit, so he thought he might try to hike up there after supper. He figures he'll stay another night in this exciting town, and then head back to his lodgings the next day. At suppertime, he stopped in the Burnt Rose Cafe, ordered the meatloaf with potatoes, and then asked the server if she knew of a way up to the top of The Wart. With a look of surprise she said, "No way! You don't want to go up there - it's haunted. We've lost too many of our lads fooling around on that rock."